Small - €38.99 Medium - €35.99 Only 1 left! Two things happened to her at summer camp last year that changed her life forever. She discovered a liking for archery; and she finally read The Hunger Games. So now she calls your neighborhood “District 12” and carries a bow on her back everywhere she goes, even to the dentist. After all, the Capitol is going to throw her into the Hunger Games for the second time and she’s got to be ready. Don’t worry, (SPOILER) even if President Snow has his way, she'll still be victorious (phew!). She'll face tracker jackers, poisonous fog, and of course trained assassins from other districts, but her spirit will help her survive the Quarter Quell (double phew!). You know what else will ensure her survival (and uttermost elation)? 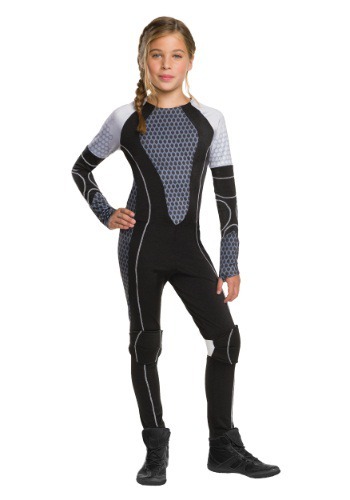 This Tween Katniss Catching Fire Costume. You can thank Cinna for its sleek design and stylish appearance. And she can thank you for being the one to provide it for her, when she needs it most...Halloween. She can finally show the Capitol not to mess with her, all while showing off her new summer skills. What a perfect fit! The graphic jumpsuit with built-in knee pads suits her need to move and roll throughout “District 12” on a daily basis, and we know she’s already got the bow to complete the look! Make you little lady the happiest (and most prepared) girl in Panem with this sleek and iconic costume.